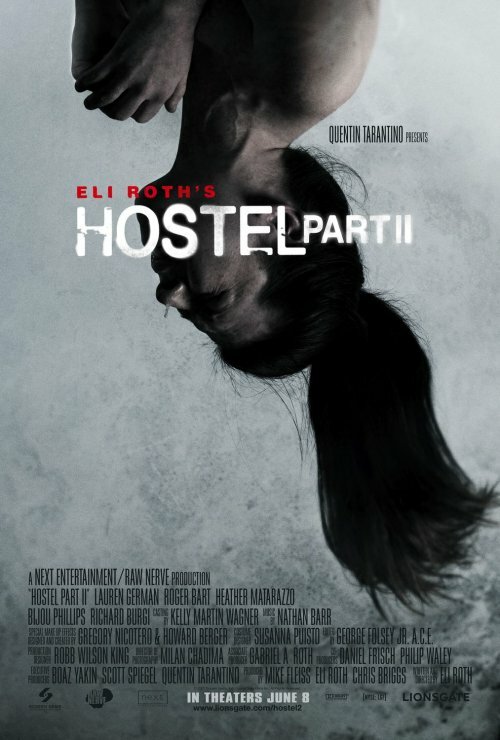 Well, this poster once again proves that Hostel Part II will be THE film to watch if you love seeing woman being tortured and murdered. A fun time at the theater! I find it hard to judge objectively the Hostel posters because I hated the first part so much (and I say this as a long time horror fan). But let me try. The reason I don’t much like this poster is because it’s so damn gray. The first Hostel also had one gray poster, and I felt that one was the least effective of that group. The other posters, which generally used a lot of red and earthy tones, were much better. More raw, more intense. The gray gives the poster a dead look, it’s a much less powerful assault at your senses. The other problem is that we basically are seeing a possibly naked woman upside down. It doesn’t really transmit that well the sense of distress and danger. Her face is obscured, so we can’t see and empathize with her expression either. Again, it’s the it seems dead thing. I’m sure it will work for some people, but it lacks the punch of the posters for the original. Or at least that is what I think.